Can a third route terminate at Alperton Sainsbury’s? The current stand is already full and it’s so full that the buses have to stand at the bus stops. Will the 79 or 245 have to move out? - that Power Road could be used for a route to terminate to replace the 391 from the west IF as predicted it is withdrawn. It would make sense that TfL changed their original 440 consultation with this in mind. I feel a bit bigheaded having predicted a cut to the 27 but I’m with snoggle on this one, the 27/N27 thing is nonsense. I’m sure you don’t need an extra bus at night to cover a short distance, especially with a 2.5-3 minute journey time in each direction. I wonder where the day buses would actually stand, the image suggests Glenthorne Road but that would likely remove residential parking. Maybe standing the 27 in the bus station will alleviate residents objections to buses standing at night in Hammersmith Grove? I really don’t get this so called issue with standardisation - it makes it much easier to follow as a passenger and prevents confusion - I’m quite happy the days of those one day extensions & multiple different routings have disappeared from London & from many networks across the country. I fail to see any waste in regards to the 64, 250 & N109 but I presume your referring to London Road. Yeh I'd say at night a N64 from New Addington to Brixton would be useful as that link existing for a long time on the original N109 and N159 and would save stand time and duplication along London Road. I totally agree about the 64 and 250, it would make sense to merge these into one route at night. In fact I read somewhere that the Sun-Thurs night service on the 250 is propsed for withdrawl, using a sensible economy measure like this might be enough to save it? TfL’s got more cuts than Spielberg! The lopping of the 27 is no surprise as TfL go looking for cost savings in lieu of the bonanza they were going to spring as part of the Oxford Street pedestrianisation. It really ought to run into Chiswick High Road at least, to maintain some kind of service beyond Hammersmith once the 391 is curtailed. The difference between the Hammersmith Bus Station and Hammersmith, Hammersmith Grove termini will not be reflected in TfL’s crappy non-descriptive blinds which will just read “Hammersmith” for both the 27 and N27. The 440 changes are quite handy around the business park and Wembley. It links Acton to Wembley for the first time in I don’t know how long. Not since the N11 a few years ago and I dunno how long for a day route. The 224 change isn’t so bad. It has become a really odd almost circular route with all the changes in recent years. The rerouting to Alperton Sainsbury’s provides a new link for local shoppers. I think the recent frequency reduction will do more harm to patronage than losing the link into Wembley. The 224 was always jammed around the Park Royal area whenever I saw it during the day. It may be different now though. I think space can be found in Alperton for the 3 buses an hour now serving this route. The hopper fare has given TfL carte blanche to shorten bus routes and inflict changes of buses on passengers increasing journey times and adding complexity to travel. My concern is that if the hopper fare is ever discontinued, those axed links are likely to be lost forever without replacement leaving passengers with more expensive journeys by bus. Sadiq Khan can shout about the hopper fare and fare freeze all he likes, but slower journeys, fewer direct links, less frequent buses, less route information at bus stops and on blinds is not going to make bus the transport choice for most Londoners. The 224 already does a double run through Alperton Sainsburys so no new link is gained. People just lose direct access to Wembley Central and the extensive local Asian shops and restaurants on Ealing Road. I wonder thou if you took a 27 from Chalk Farm you could even get to Hammersmith and then onto another bus within an hour. Good point - only at the extremes of the day and with zero delays. Daytimes the journey time is around 60 mins Chalk Farm - Hammersmith so the Hopper Fare is pointless assuming you have a longer than 2-3 minute wait. The actual interchange time is 70 minutes but even with lots of buses heading west from Hammersmith it still takes time for people to alight from a bus and find the appropriate stop. Obviously coming in the other direction it's easier as the time from Chiswick to Hammersmith is normally well within a hour and the 27 is not proposed for a frequency reduction as part of this consultation (doesn't mean one won't be implemented at a moment's notice though). Just looked at the consultation again and that looks cheeky. They’ve suggested they run 30 buses an hour on Chiswick high road but 22 between Turnham Green and Hammersmith. 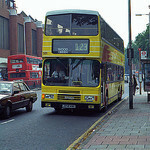 Would the Chiswick high road data therefore include the 237? That would be somewhat misleading since the 237 doesn’t provide the through route that encompasses the entire withdrawn 27 section! Ah yes, you are right. But never mind, [insert blurb about hopper fare and fare freeze here] making bus travel easier and cheaper than ever before.